Telemarketing is still relevant, because it still works! To develop a solid B2B telemarketing program that drives sales, a strategic plan must first be developed. Without an effective telemarketing plan, lead generation can easily fall short of company goals. By creating a sort of blueprint for B2B lead generation telemarketing, your team will identify each target and the most effective way to communicate. Careful planning delivers consistent results. Ready to get started on your B2B telemarketing plan? Before you do, take a look at these five tips for doing it right from the ground up. Begin by identifying and outlining your main objectives, spending time on the planning, bringing in a breadth of team members for a well-rounded approach. Each objective needs to be tied to a specific goal. Acquisition of market intelligence—current tool, contract expiration, updated players, etc. When defining your objectives, be sure to consider the other processes in place (lead nurturing or lead follow up). Having a full-scope view of the sales leads telemarketing process assures leads from marketing that are more efficiently collected, processed, and delivered. This means more legitimate leads, more closing opportunities, and less wasted time and money. For a telemarketing campaign to work, a healthy flow of information between all involved parties is crucial. From vendor to marketing to sales, open communication with everyone is what keeps the campaign running smoothly. Team collaboration and communication ensure that information collection is consistent, in turn adding value to your business and assisting with goals—now and down the line. Determine how leads are to be handed off, and clearly communicate that process to your marketing and sales teams. Chat with the Telemarketing experts! Want to have a chat with the sales leads telemarketing experts at ResponsePoint? Set up a free, no-obligation phone call. In one 15-minute conversation, you may discover a better way to boost your ROI. Cold calling is difficult, and not considered a fun part of sales; most professionals will admit that. Being a successful telemarketer goes far beyond reading from a script. It’s a true skill that requires time, training, and an innate ability to project trustworthiness and credibility. A successful telemarketing b2b lead generation program doesn’t come from being too focused on lead volume at the detriment of lead quality. Your telemarketing partner needs to help you establish a campaign using an enthusiastic, knowledgeable, and articulate team of individuals that is deeply focused on the quality of work. These telemarketing professionals are extensively trained to be master conversationalists and listeners, turning the cold call into a warm conversation. It is neither forced nor hurried, but authentic and inviting; it draws the potential customer in and lets them feel like they are steering the boat. Reading from a limited script will not produce the same quality of results. The target list and therefore data quality are essential to a successful campaign and it’s not something to approach casually. Consider your campaign objective(s) when creating your target list. If your objective is to occupy your sales people with quality leads, then invest time to develop your target list. The cheaper option is rarely the best option when selecting data for your campaign. If the B2B lead generation telemarketing campaign is related to the launch of a new company, service, or product, include a broader target audience to test for traction. Identify targets that would clearly benefit from your service or product. Test your list and cull it down by identifying where the response is focused. Don’t be fooled into thinking that the traditional tool of Telemarketing in B2B is a dinosaur. Telemarketing is an essential component for lead generation, and to be successful you need the right team and strategic planning. 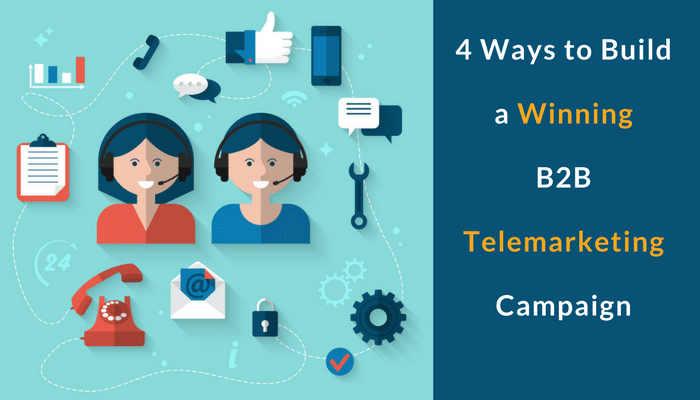 Incorporating telemarketing into any campaign (whether currently running or about to launch) can accelerate and improve lead quality through the entire funnel. Adding a human touch to customer communication adds credibility, builds trust, and validates or corrects any target market assumptions. Your campaign can therefore keep a forward momentum, evolving as data continues to inform the process.